For FAITH Circle's July quilt assignment I chose Rachel/Wooden Spoon Quilts' Raspberry Kiss block, upsized to 12 1/2" unfinished. The coral and yellow palette was an unusual one for me, but it was definitely cheery. I asked for backgrounds that were black and white or gray and white low-volume prints, white on white prints, or a very pale gray solid. I kind of forgot my original plan once the blocks started coming in, and when I put them all on the design wall, I arranged them 'square'. A friend happened to stop by and saw them and mentioned how she thought they'd look good set on point, and lightbulb! I remembered that was what I had meant to do. So I rearranged them, made a couple more blocks to fill in gaps, and set to work cutting setting triangles. I referred to this resource for the calculations needed. 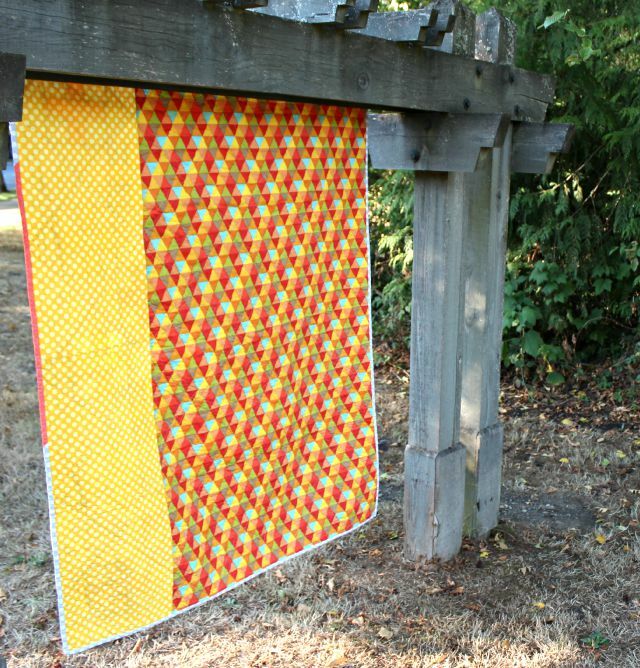 For backing I was pleased to find Thomas Knauer's Frippery in my stash to use as the main fabric, and paired it with some yellow Michael Miller Ta Dots to bring it to size. Quilting was done with Aurifil 50wt #2021 (Natural White) in a serpentine stitch cross-hatch, leaving the quilt very soft and cuddly. Binding was most more of those Michael Miller Ta Dots, accented with just a bit of Carolyn Friedlander's Architextures crosshatch print. Seeing as this sweet finish will be heading soon to Restore Innocence, Faith Circle's chosen charity, I washed it right up, and had it in the car throughout our busy weekend, just in case we found a setting for a quick photo shoot. Finally, heading home after our last commitment, I noticed a neighborhood park with a charming trellis which suited our needs perfectly. The end. This project was on my 2015 Finish-A-Long Q3 List. Linking up with Fabric Tuesday, Sew Cute Tuesday, and Finish It Up Friday. Isn't it amazing how different a layout can look when blocks are set 'on point'? What perfect backing you had too! Another wonderful finish which will surely be appreciated Debbie! Beautiful and love these colors! I'm loving this block! The lightbulb moments are always fun! It really lights a fire under you to complete a quilt! On point was a perfect choice for this one...its gorgeous! This is a beautiful quilt. Unexpected colors that look wonderful and bright. I love, love, love the backing. It's lovely. 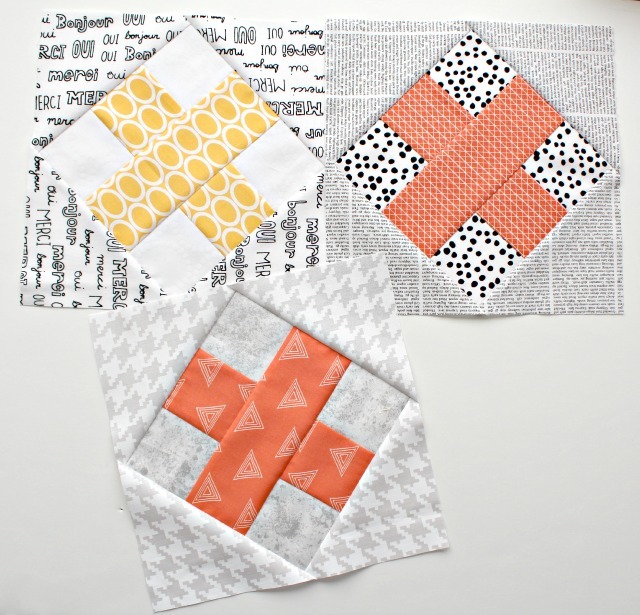 I really do love orange, another orange quilt is in my future. Congrats on another FAL finish!! Love that you put the blocks on point! This is so beautiful Debbie - the colours are just perfect together! Frippery is perfect! 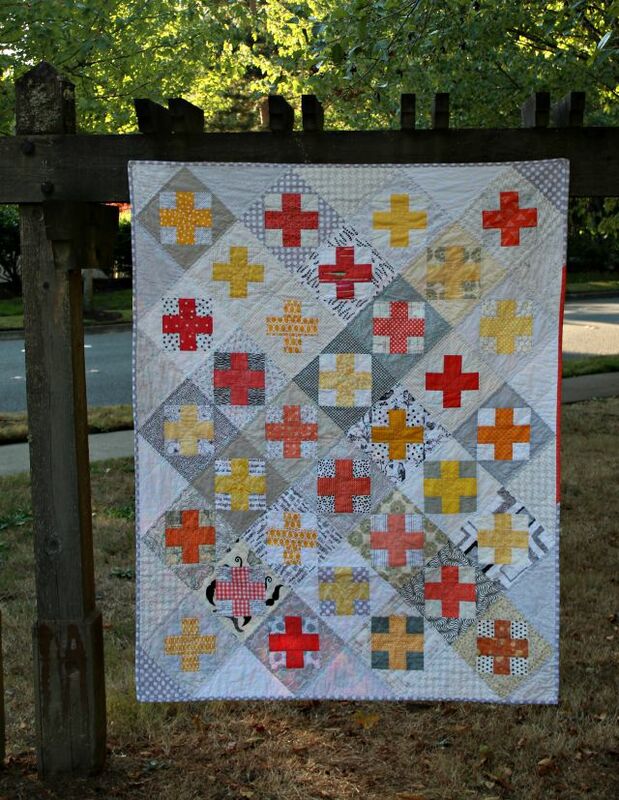 Good job and very nice charity quilt. Excellent quilt. Well done to you and your group! It is gorgeous! I love the colors in this one. A beautiful finish, Deb! 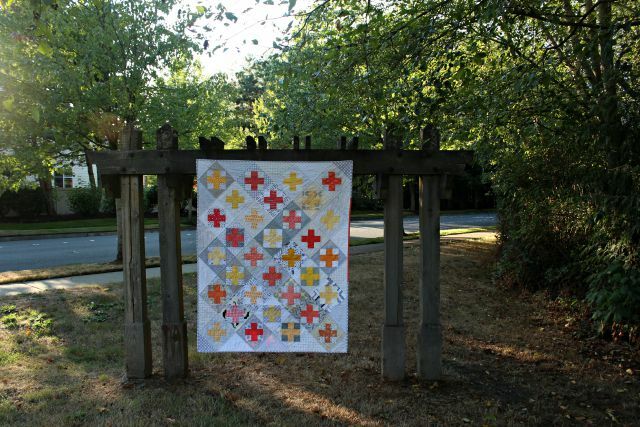 I love your block choice and the colours in this gorgeous quilt. Well done to you and your group! Amazing and beautiful. To bad it had to go away so soon this would have been a great one to show at the FIQ meeting in October, "Creative use of Neutral Fabric". Beautiful quilt! You found a great setting to photograph it too! Love the on point setting. It was just right. Pretty colors too. I really like this quilt. The colors work together perfectly. I smile at the mention that you had forgot you originally meant to put them on point. We much be the same age! Very nice finish! 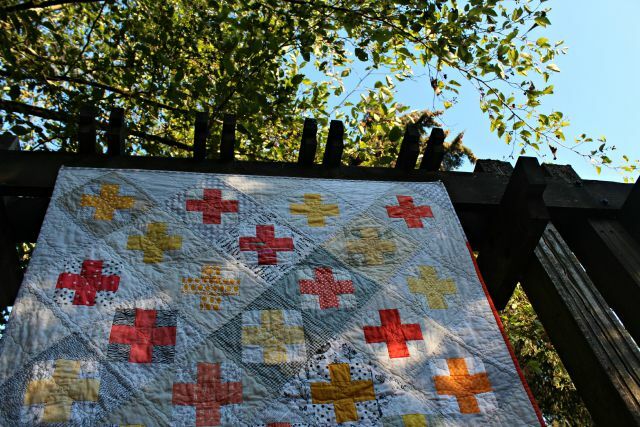 love love love the colors in this "on point plus quilt". interesting plus variation. I love everything about this one! Thanks for all your inspirations. Wow! A lovely combination of colors! Beautiful!! Beautiful blocks and the colours work perfectly together!